Fire ants are not a native of United States of America; nevertheless, they are now present in large numbers, all over the country. They are red-brown and black in color, about ¼ inches in length. Their nests can usually be found in grass covered areas like pastures, fields and lawns. These ants have the resilience to defy the apocalypse. Seriously. It would take 2 weeks of temperatures below 10°F to kill an entire colony; and an entire colony can contain up to 200,000 ants. They can also feed on crops and animals, apart from insects. Also, they cannot be drowned in water. They form a nest in water and float it to a dry area. It doesn’t help that fire ants do not have a predator in the United States, thereby causing their population to grow substantially. Fire ants dwell in large numbers and can be very aggressive during attacks if their nests are disturbed. They don’t as much as bite, as they sting. Fire ants attack in swarms and each fire ant can sting multiple times. If you experience any of the above reactions, you need to get medical attention right away. However, allergic reaction to fire ants is not that common. 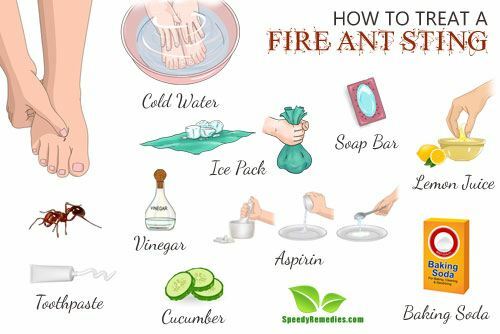 Most often than not, you can try out the below given tips to treat a fire ant sting. As soon you discover the sting, wash the area with cold water and soap. Gently clean the area to remove any dirt so that the area doesn’t get infected. Use an ice pack, or wrap a cube of ice in a towel, and press it on the affected region. Ice the sting for 15 minutes, followed by a 15 minute interval. Do not put ice directly on to the skin as it can get stuck to it. Ice cubes can help prevent inflammation or swelling. It also provides a cooling effect on a burning sting, thereby relieving some of the pain. The easiest available treatment is an anti septic soap bar. As soon as you realize that you have been stung by a fire ant, press the bar of soap gently and rub it on the affected area. This will form a protective coating to stop infections and prevent bacteria from getting deeper inside the skin. Pressing soap bar is also a good way to reduce pain, inflammation and itching from the sting. Lemon is a natural antiseptic and is used to treat problems related to skin like, sun burn, bee stings, eczema and others. It can also be used in case of a fire ant sting. It helps reduce the pain and the irritation that may be caused by the sting. Just squeeze a few lemons to get fresh and natural juice from them. Now apply it on the affected area of the skin. Wash with cold water after 20 – 30 minutes. You can follow this method till you see some result from the tip. Vinegar contains antibacterial properties. This naturally occurring property allows vinegar to prevent any bacterial infection on the surface of the skin. Mix vinegar with some water and apply it immediately after the fire ant stings. It will treat the irritating sensation felt after the sting. Aspirins can be used to provide relief from severe insect bites, including the sting of a fire ant as it contains anti-inflammatory properties. Crush an aspirin tablet. Mix it with little water to turn it into a paste. Now apply on the affected area of the skin. Leave it overnight to get relief. Toothpaste is widely advocated for a number of problems, including burns, mosquito bites and others. Presence of methanol or peppermint in toothpastes provides a cooling sensation when applied. When applied on a fire ant sting, toothpaste will numb the area, providing you with a relief from pain and itching. It will counter the burning sensation of the sting with a cooling effect. It also stops the area from swelling as application of toothpaste masks the histamine action. Cucumbers have anti-inflammatory properties which help to cool down any inflammation in your body, or on it. It is an effective remedy for instant relief from the sting. If a fire ant stings you, take a cucumber, slice it into pieces and rub them on your skin. By gently massaging the affected area with cucumber, you will receive a relief from pain and irritation of the sting and experience a cooling sensation. Calamine is widely known for its benefits to the skin. It has been used to reduce itching from mosquito bites, chicken pox, bee stings and ant stings. Calamine can sooth the skin and provide relief from itching. It also prevents inflammation of the skin. During a fire ant sting, apply copious amounts of calamine on the affected area and leave it on till the pain and itching from the sting subsides. Application of calamine lotion will treat fire ant stings completely. Salt works as a great exfoliate for the skin, as it cleans the pores deep down. It also has anti-bacterial properties which prevents infection in the skin. Mix salt with water to make a paste. Apply it on the skin properly to make a coat of it on the surface of the skin. The coat will prevent itching, swelling and any possible infection while also keeping you from accidentally scratching it. Baking soda is basic in nature and applying it on the sting will restore the pH balance on the affected area of the skin. Take some baking soda and mix it with water to make a paste. Apply it on the affected areas and then make a thin coat of it, covering the entire area where the fire ants stung. Leave it on for some time. The paste will prevent itching and infection that might be caused due to the sting. Alcohol or any beverage with high alcohol content can be rubbed on insect bites and stings to reduce itching and pain, while also preventing swelling. Take a bottle of vodka, mouthwash, hand sanitizer or just simple alcohol and dab some of it on the affected area. Keep applying fresh coats until the pain and itching subsides. While these remedies are quite effective when dealing with normal fire ant sting reactions, remember that an allergic reaction can be dangerous to you and you should receive immediate medical attention. And as much as possible, avoid those fiery red fire ants because like we said, they can be pretty aggressive.